In March, I posted the titles of books read independently by my students, most of whom are self-proclaimed non-readers and lag behind their peers in grades and standardized testing. I wanted to do a follow-up to give credit to my students, some in particular who became….readers! !, and to the authors who wrote books that engaged these teens. On the independent reading front, some students took off. Using their “Lexile” scores, we were able to find books that matched their reading level. Not every student turned the reading corner. A couple of students still struggled to complete a novel, even with more appropriate choices and time to read. Others, though, were on fire in the best possible way! In general, students read more. 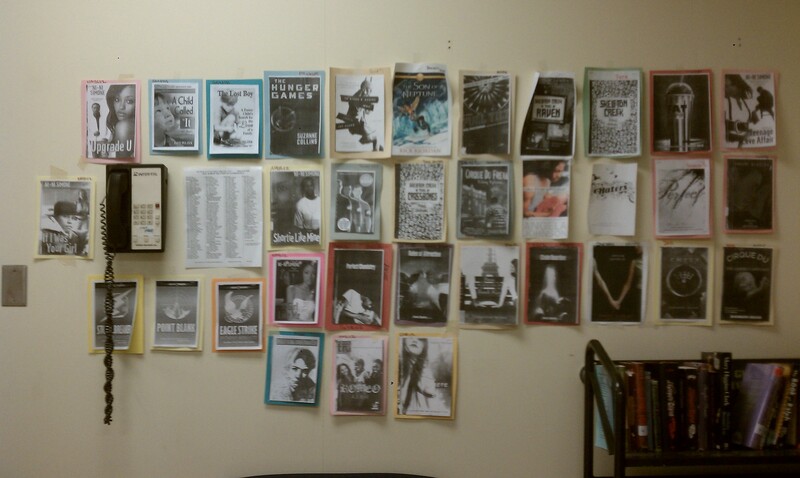 Each time a student finished a book, I made a copy of the cover and pinned it to the wall. And…drum roll please…here is the wall at the end of June. Keep in mind that some of these books were read by several students. For example, many of my girls blazed through the PERFECT CHEMISTRY series by Simone Elkeles. Each book cover is on the wall one time, and I added the students’ names to the colored border. So, really, you can probably double the number that’s on the wall. (Pause as I shed another teacher tear of joy). …big applause for a certain student and certain authors. This student read the PERFECT CHEMISTRY series and the PARADISE books and then recommended them to her friends. She then searched for something similar and discovered Ni-Ni Simone. She read all of the titles we have in our school library before the end of the school year. In total, she read 14 books, not counting what she had to read for her classes. And, guess what, when I assessed her reading levels at the end of the year, her scores had improved on every test. That’s fantastic! Parents often say to me that their kids aren’t readers, and I usually say they just haven’t found the right book. That’s true! If they can find the right book, then we can follow up by giving them books with similar themes, etc.